This simply is the best Digital SLR out capable of 8fps for 21 frames and is capable of 4 million pixels. I carry 3x 1GB IBM MicroDrive's and 3x340MB MicroDrive's around with me. This will give me a very large shooting capacity in JPG format, and quite an impressive capability in RAW format. These cameras and lenses create superb photos when printed up to 11.7x16.5" (A3) and are great for magazine and newspaper photos. This gives me an awesome setup! 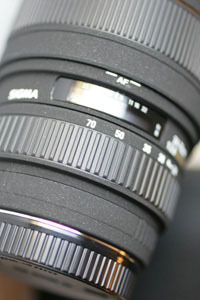 The EOS-1D has a magnification of 1.3x compared to 35mm. I usually have my EF 500/4L IS coupled with the EOS-1D. On this page you will replace the equipment.jpg with your own equipment picture and replace the above text with your own details.